Fans outside Fenway Park do a double take as the man with the hair clippers steps from a champagne-colored Hummer. Sporting a diamond stud in each ear, he's dressed in an oversize Red Sox jersey -- No. 99 -- and baggy jeans tucked into his socks. 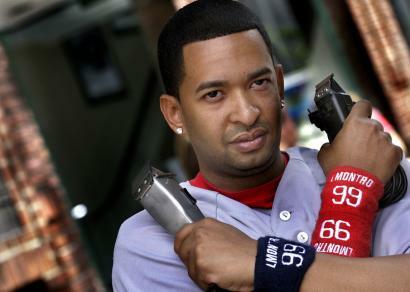 Meet LMontro, the unofficial barber of the Boston Red Sox, a colorful coiffeur recruited by David Ortiz to trim the team's tresses, beards, and brows. His mantra: "If you look good, you play good." LMontro isn't on the payroll, and you won't find his unusual name anywhere in the Red Sox media guide, but the New York native, who calls the Brookline Holiday Inn his crib during the season, has nonetheless become an integral part of the team. He's with the Red Sox at home and on the road, and routinely tidies up pitchers on game day. Big Papi and Manny Ramirez frequently wear wristbands bearing LMontro's name and number. "Whether you need a cut or just a nice little edge or fade, he's the man," said centerfielder Coco Crisp as LMontro styled him at his Cam bridge condo. "What he does for me is edge me up real nice." The 30-year-old LMontro does most of his manscaping a few hours before first pitch in a closet-size space not far from the Red Sox clubhouse. His tool of choice is an old-style hair trimmer, which he keeps in a Red Sox beer cozy. "Each of these guys is like a character, and each one has their thing -- Papi's beard, [Dustin] Pedroia's sideburns, [Mike] Lowell's little mustache," says LMontro, sipping lemonade before a recent game. "The Yankees are all shaved and boring." Born Angel Lucas Pena, LMontro graduated from Baruch College in New York with a degree in marketing management. He began cutting hair at 15 as a hobby, starting with his cousin whose 'do he botched so badly the boy had to wear a hat for a week. "Yeah," LMontro admits with a sheepish grin, "it didn't look so good the first time." Before long he was giving haircuts to his friends and family in New York's Washington Heights, the largely Dominican neighborhood where LMontro's mother, a seamstress, and father, a mechanic, raised six children. "It was $8 for a haircut," says Angie Ramirez, one of LMontro's sisters. He dreamed of becoming a baseball player, an agent, or an actor. But to make ends meet, LMontro cut hair. He coined a silly sobriquet, calling himself LMonstro, a variation of El Monstruo -- Spanish for "The Monster" -- before shortening it to LMontro. He'd cut a few major leaguers while in New York, including Alfonso Soriano and Miguel Tejada, but his big-league break came 18 months ago in Florida. While working at a barbershop in Miami, LMontro saw an ad on television for the World Baseball Classic, which was about to be played in Orlando. "I said, 'Yo, there are going to be lots of guys there who need barbers,"' he recalls. "I rented a car and drove there with my clippers." As he watched the Dominican team take batting practice, LMontro looked for the loudest player, figuring he'd attract the most attention. Settling on second baseman Ronnie Belliard, LMontro passed him a scrap of notebook paper with his name and number, and arranged to do his hair. "The next day, Ronnie was looking pimpin', he was looking really good," says LMontro. "When I got back to the hotel that night, there were 10 guys waiting in line to be cut." Over the next few days, he styled some of the best players in Major League Baseball, including Ortiz, Jose Reyes, and Albert Pujols. Suddenly, he had an all-star clientele that kept him on speed-dial. During the 2006 season, LMontro flew back and forth across the country cutting members of the Yankees, Mets, Marlins, Orioles, Tigers, and Red Sox. "I couldn't settle with one team," he says. LMontro might have had the same schedule this season, but something happened during spring training. In March, LMontro was in Fort Myers, Fla., about to give Ortiz a trim, when he got a call from Tejada. The Orioles shortstop was in Fort Lauderdale, and asked if LMontro would come and give him a quick cut. "I told Papi, 'I'll be back,"' says LMontro. "I was about halfway there when Papi called me and said, "Make a U-turn.' I've been exclusive with the Red Sox ever since." Although LMontro goes on the road with the team, he travels separately from the players, paying for his own airfare and hotel. Typically, he says, he cuts two or three players a day, and has groomed virtually every member of the team, as well as some of the players' kids, and assorted clubhouse personnel. The one player who has so far declined is Japanese pitcher Daisuke Matsuzaka. "I've done his trainer and his translator, but not him," says LMontro. "I think it was a test, and I think I passed. He's next." LMontro won't reveal what specific clients pay, but said it's not unusual to collect $1,000 for a cut. Driving a Hummer with Louis Vuitton leather seats, gull-wing doors, and a satellite dish on the roof, he certainly looks like he's living large. "They take care of me," he says of his clients. Ballplayers outside Boston are not as happy with the new, Sox-only arrangement. LMontro says he often gets calls from players on other teams requesting haircuts, but he has to refuse. He made an exception at the All-Star Game, where he served as stylist for the American League squad. (He celebrated the occasion by shaving the numbers of the six Red Sox All-Stars into the back of his head.) "The job he does is great," says Kansas City pitcher Odalis Perez, who tried unsuccessfully last week to get LMontro to give him a cut when the Royals were in town. "Wherever he is, I try to get him a flight, but he gives me a hard time and says he's with the Red Sox now." LMontro says he's enjoying himself in Boston and may stay awhile. "At least until I get a ring," he said. "I'll be the first barber with a ring."